Carolina Wren Press, 9780932112934, 88pp. 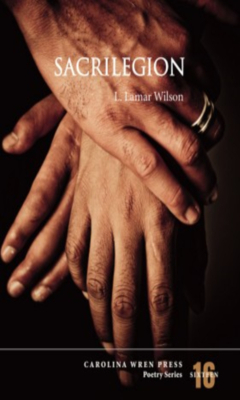 L. Lamar Wilson's poems have appeared in African American Review, Callaloo, jubilat, Los Angeles Review, The 100 Best African American Poems, and other journals and anthologies. He has received fellowships from the Cave Canem Foundation, the Alfred E. Knobler Scholarship Fund, and the Arts and Sciences Foundation at the University of North Carolina at Chapel Hill, where he is pursuing a doctorate in African American and multiethnic poetics.